Affordable housing connects communities and cleans the air. On a crisp Friday in West Sacramento, Esther Robert and her children are preparing for the weekend. The kids are driving to LA to celebrate Narissa’s 21st birthday. Narissa and her sister Nadine, 22, touch up each other’s makeup, hair and clothes, shouting down the stairs to their mom who is online renting them a car. Their chihuahua mix, Skittles, barks at the top of his little lungs as he chases the activity through the lively home. Esther also has two boys. Mario, 24, lives across the street and has two little boys of his own. Isaac, 18, has curly black hair and a large shiny stud in his ear, his face buried in his phone like most teenagers. “My family is everything to me,” Esther tells us, and it’s plain to see. We are gathering at their home to learn about how living in an affordable housing development has affected her life and family. A new affordable housing development, West Gateway Place, is under construction in West Sacramento, and it will be the first affordable housing development in California to be completed with financing from funds collected under California’s cap-and-trade program, which charges polluters for the right to emit greenhouse gases (GHGs) that drive climate change. By law, these dollars – totaling over $3.5 billion as of November 2015 – are deposited into the Greenhouse Gas Reduction Fund (GGRF) and must be invested in projects that clean the air and promote clean energy and transportation. Esther, open and confident, tells us her kids were reluctant about talking to us because they are afraid affordable housing carries a stigma. They mostly stay clear of us, but are polite out of respect for their mom. 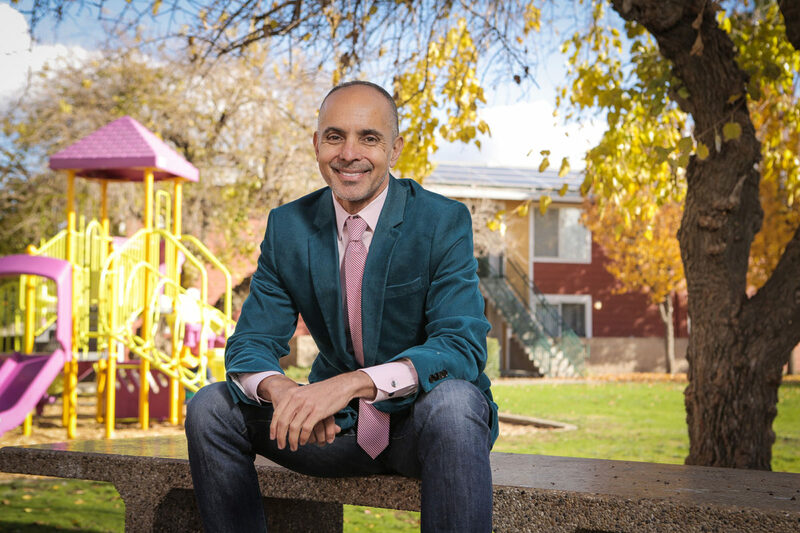 West Sacramento Mayor Christopher Cabaldon outside the home of Esther Roberts at the West Capitol Courtyard Apartments. “Anybody and everybody might need affordable housing,”Cabaldon says. A lot of people opposed the West Capitol Courtyard Apartments development where Esther and her family live, explains West Sacramento Mayor Christopher Cabaldon. who stopped by Esther’s home to talk with us. Built in the mid-‘90s, it was the first modern affordable housing complex in West Sacramento. He notes that there has been no opposition to the new developments he has championed on and near the Sacramento River, including West Gateway Place, that together include hundreds of units of affordable housing along with market rate housing and retail. Peoples’ attitudes around affordability are changing, the mayor says, because as housing prices in California escalate, people realize guaranteed affordable housing is something we all might need. He also notes we’re doing it better. Architect’s rendering of West Gateway Place in West Sacramento. By linking residents to public transit, biking and walking, the project will cut greenhouse gas emissions by an estimated 723,286 metric tons. 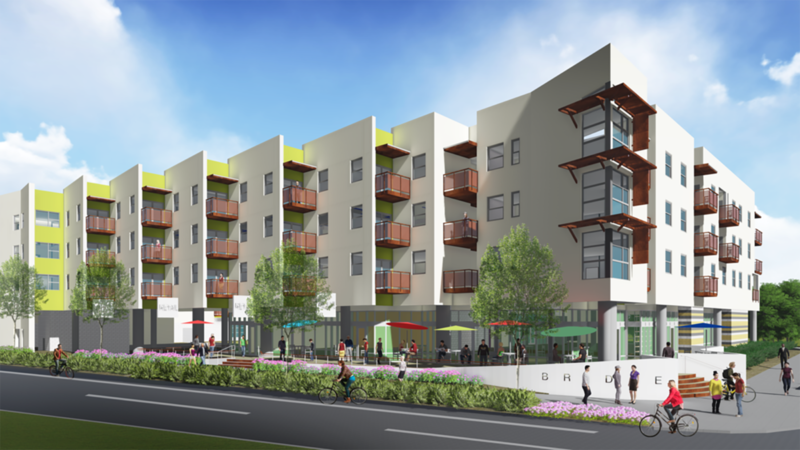 Of the $122 million in GGRF funds allocated last year through the state’s Affordable Housing and Sustainable Communities Program, $6.7 million went to West Sacramento, with $2.6 million going to West Gateway Place. The rest of this money was allocated to transit infrastructure, making many neighborhoods in the area more accessible for walking, biking and public transit. “Walking isn’t just for the Petalumas,” quips the mayor, who has been elected by his community four times. According to West Gateway Place developer Jamboree Housing, the transit-friendly nature of the new mixed development will help fight climate change by reducing GHG emissions by an estimated 723,286 metric tons —equal to taking 140,483 cars off the road for one year—while helping more working families like Esther’s have a good place to live. Esther and her family have lived in a very comfortable, well-maintained four-bedroom unit at the West Capitol Courtyard Apartments for six years, paying $880 a month. To Esther, a single mother, this home made all the difference in her ability to take care of her family. “If it weren’t for the rent rate, I would be living in a studio with all of us. With affordable housing, I can keep a decent home for all of us. I can pay rent and pay my bills,” she explains. Esther speaks candidly as she sits at her kitchen table, wedged neatly in between two large glass cases overflowing with athletic trophies. Mario played baseball and football and Nadine did cheerleading and baseball (rather well, it seems). “If I didn’t have this place, my kids would have been in the [foster care] system,” she says, nodding at a framed photo of the year when Mario was prom king while Nadine was prom princess. With help from her sister and family, Esther is healthy and addiction-free and has been working at Clark Pacific Construction in procurement for three years at $15 an hour. She recently secured a salaried position as an administrative coordinator at DeVry University in Cordova. She now hopes to be able to buy her own home so she can leave it to her kids. The kids all have jobs, too, and Nadine is saving for college in hopes of becoming a juvenile criminal defense lawyer. GGRF funding will soon put more affordable housing projects close to transit in communities throughout California. If done sustainably, by integrating transportation and connecting to the larger community, affordable housing developments not only lose their stigma but become something sought after. By helping residents get to work without driving, they improve the air for us all. The mayor himself just moved into a mixed-use development on the riverfront not far from West Gateway that includes market rate units, affordable housing units and retail. “I want to live in a diverse economic neighborhood that has all kinds of people in it, living productive lives,” he explains.